The International Court of Justice has rejected claims of genocide by Serbia and Croatia against each other during the Croatian war of secession from Yugoslavia. The Croatian government had alleged that Serbia committed genocide in the town of Vukovar and elsewhere in 1991. Serbia later filed a counter-claim over the expulsion of more than 200,000 Serbs from Croatia. About 20,000 people died during the 1991-1995 war, mostly Croatians. 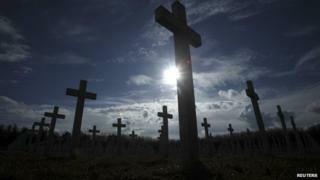 The Croatian town of Vukovar was devastated when it was occupied by Serbs for three months in 1991. Tens of thousands of ethnic Croats were displaced, and about 260 Croat men were detained and killed. Four years later, the Croatian military's Operation Storm bombarded the majority ethnic-Serb Krajina area, forcing about 200,000 people from their homes. Speaking in court on Tuesday, Judge Peter Tomka dismissed both the Croatian claim and the Serbian counter-claim. Forces on both sides had carried out violent acts during the war, Judge Tomka said. However, neither side had provided sufficient evidence to demonstrate the "specific intent required for acts of genocide". The court's ruling was posted online. The International Court of Justice has delivered the result that most people here were expecting, with both genocide suits dismissed in their entirety. The only mystery is why the cases ever progressed this far. It is hard to see what either side was hoping to achieve - other than to have unflattering details from the conflict of the 1990s highlighted once more. Both Croatia and Serbia may have been cleared of genocide, but the ICJ said that both sides had deliberately forced minority ethnic groups out of areas they controlled. So there is little cause for celebration in Belgrade or Zagreb. But at least a toxic saga which has been rumbling for 16 years has finally drawn to a close. Serbian Justice Minister Nikola Selkovic said the ruling would "start a new and blank page in our relationship with Croatia" and Serbian President Tomislav Nikolic said he hoped it would lead to "a period of lasting peace and prosperity" in the region. Croatian Prime Minister Zoran Milanovic said: "We are not satisfied with the court's ruling but we accept it in a civilised manner." Croatia filed its initial case with the International Court of Justice - the top UN court - in 1999, accusing Serbs, led by President Slobodan Milosevic, of targeting ethnic Croats during the conflict. It wanted Serbia to pay compensation for damages "to persons and properties as well as to the Croatian economy and environment". In 2010, Serbia responded to Croatia's case with a countersuit, saying that ethnics Serbs were expelled when Croatia launched its 1995 operation to retake territory captured by Serbs. "What is generally called ethnic cleansing does not constitute genocide," Judge Tomka said in his ruling against Serbia's claim. "Acts of ethnic cleansing may be part of a genocidal plan but only if there is an intention to physically destroy the target group." The BBC's Anna Holligan in The Hague says although genocide is the most serious of international crimes, it is also the hardest to prove. Relations between the two countries have improved in recent years but in 2012 Serbia was outraged when Operation Storm commander Ante Gotovina was cleared on appeal by the International Criminal Tribunal for the former Yugoslavia. Last week, ahead of the verdict, Vukovar resident Kata Lozancic told Reuters news agency she believed genocide had taken place in her town. "Everything from cultural and natural sites, to people, everything was destroyed," she said. A refugee in Serbia, identified only as Dragica, expressed unhappiness at the Croatian government's claims. "They expelled us Serbs, and now they [claim they] are not criminals, and we are," she told Reuters. Yugoslavia became a Socialist state after World War Two. It consisted of six republics: Bosnia-Herzegovina, Croatia, Macedonia, Montenegro, Serbia and Slovenia. The federation began falling apart in the early 1990s. Slovenia, Croatia, Bosnia and Macedonia declared independence, sparking conflicts with the Serb-dominated Yugoslav army. All four countries were eventually recognised as independent by the UN. In 2006, Montenegro also emerged as a sovereign state after a referendum for independence, ending the former Union of Serbia and Montenegro.